(Note: You can watch Sirota deliver a short YouTube video version of this article by clicking here or by scrolling to the bottom). Other than word that carnivorous Americans might have to curtail their unhealthy, environmentally destructive, inhumane and overly subsidized meat eating habit for a few weeks due to meat plant closures, the only other big piece of good news from imminent sequestration-related budget cuts is that they might slightly curtail defense spending. You can be forgiven if the use of "slightly" prompted a double take and then disbelief. After all, for the last few months, we've been hearing apocalyptic warnings about any proposed cuts to the Pentagon. For instance, the Chairman of the House Armed Services subcommittee on readiness, Rep. Randy Forbes (R-VA), predicts crippling job losses from any defense cuts. Likewise, defense contractors argue that sequestration cuts are "irresponsible" because they will "shatter our ability to execute the U.S. national security strategy." It's the same line from House Armed Services Committee Chairman Buck McKeon (R-CA), who says budget cuts "would devastate our Armed Forces." Meanwhile, President Obama used this week's State of the Union speech to claim that the cuts "would jeopardize our military readiness" and outgoing Defense Secretary Leon Panetta says that “instead of being a first-rate power in the world, we would become a second-rate power," if sequestration cuts were allowed to happen (employing the tactic of portraying opponents as traitors to country, Panetta then argued that those who support such cuts are trying to "deliberately hurt this country"). First and foremost, it's worth noting that it makes no sense for a Republican Party that claims government spending cannot create jobs to then turn around and oppose government spending cuts on the grounds that it will eliminate jobs. But whether or not you find that GOP incoherence distasteful, the bigger questions still remains: are the apocalyptic predictions accurate? Let's start with the jobs argument. How big will the job losses be? And could they be prevented? The answer lies in a new study by the liberal-leaning Center for International Policy and supported by the conservative Cato Institute. Responding to defense industry claims that sequestration will kill one million defense jobs, it finds that number is "exaggerated by double or triple" - and, as important, those lawmakers who claim to oppose sequestration on job-cut grounds could simply work to change spending priorities to mitigate those Pentagon losses. How? By backing increased spending on social programs that data show create far more jobs-per-dollar-spent than Pentagon expenditures do. (This might explain why Defense Secretary nominee Chuck Hagel said, the "Defense Department budget (is) not a jobs program" - or at least not a very efficient one). Those data points about which programs most quickly create jobs juxtaposed with a January national Republican radio address lay bare the reality that in the sequestration fight, the GOP doesn't actually care about jobs. In that January 13th address, Nebraska's Republican Sen. Deb Fisher laid out the GOP's proposal to void all defense cuts and replace them with massive reductions in social programs. Put another way, the Republican proposal - which polls show Americans oppose - is to void cuts to the programs that least efficiently create jobs and replace them with cuts to programs that most efficiently create jobs. A headline in Defense News, a trade publication, summarizes the CSIS findings well: "How Big Would DoD Budget be Under Sequestration? Pretty Big, It Turns Out." The article accompanying that headline correctly notes that while annual Pentagon spending would drop 31 percent during this (allegedly) concluding period of the Iraq and Afghanistan wars, "that compares to a 33 percent decline after Vietnam, a 36 percent post-Cold War drop" and a 43 percent cut after the Korean War. 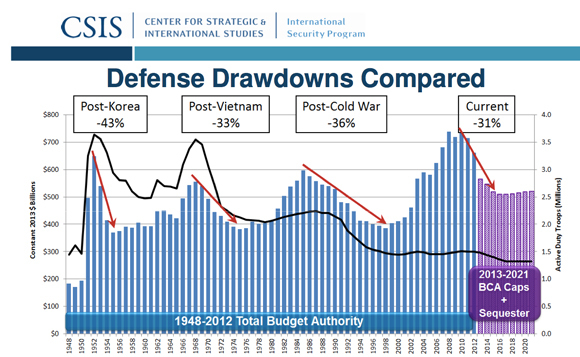 In other words, despite America closing out the longest continuous era of war in its history and one of the biggest national security buildups ever, sequestration means Pentagon spending would still only face the smallest post-war reduction in more than a half century. The result, says Ronald Reagan's former assistant Secretary of Defense Larry Korb, would be a defense budget leaving the United States "still spending more than the next 14 nations in the world combined, most of whom are allies." In historical terms, he says, "spending would still be higher in inflation-adjusted dollars than the Cold War average." This, despite the fact that we are facing a threat that most agree is no bigger or more existential than that of the nuclear armed Soviet Union. In fact, looked at through the prism of the Cold War, those opposing imminent sequestration cuts to the Pentagon on national security grounds are effectively arguing that many of Ronald Reagan's Pentagon budgets at the height of the cold war were too small to the point of endangering America. Considering all these truths about how immense the post-sequestration Pentagon will be, why do we nonetheless continue to hear the apocalyptic rhetoric? The Pentagon budget right now is so wasteful that auditors lost track of $1 trillion. How can anyone look at that fact and the facts showing how comparatively tiny the sequestration cuts are and yet still claim those cuts are disastrous? As always in politics, the answer can be found by following the money - specifically, defense contractor money. The last decade has been an unprecedented jackpot for the private corporations that end up being the recipients of so much Defense Department cash. As I've previously noted, those companies' profit margins, campaign contributions, lobbying and think-tank underwriting make it, by far, the most powerful pillar of the power structure that undergirds Washington and the political media. All that power translates into pre-fabricated political consensus - one that pretends any change of the status quo would be a full-scale cataclysm. In a sense, that consensus's agitprop represents a preemptive form of what's known as Disaster Capitalism - it pretends there would be a disaster unless military profiteering is allowed to continue at its present levels. But as retired U.S. Army Lt. Col. Anthony Shaffer told the Washington Business Journal, America has to reject the propaganda of a defense industry that is "addicted to money." Arguing that there are "tons of cuts we can still make" even after the sequestration cuts, he says "we've got to look at what's best for the country, not what's best for some of these contractors." Doing that, of course, doesn't mean supporting sequestration in its entirety - lord knows there are plenty of reasons to oppose the government-wide package of spending cuts. It merely means acknowledging that the specific defense cuts in that larger package are anything but radical. They are the least we should be doing to prevent a new era of permanent war.